I remember as if it were yesterday: January, 2007. I was sitting in my neurologist’s office after suffering my third relapse in eighteen months. At that moment, I felt that my MS was a runaway locomotive barreling down the tracks and I needed to somehow find the emergency brake. My neurologist at the time was new to my case because my previous neurologist took a new position as a stroke specialist at a Boston hospital. I was in to see my new neurologist because I needed to switch medicines due to an allergy I had developed to interferon. Prior to this visit, I had researched a breakthrough new treatment that had only been on the market for six months. This treatment had been voluntarily removed from the market due to unforeseen deaths during clinical trials and had just received FDA approval for a re-launch in the summer of 2006. Despite the risk associated with this treatment, it showed potential to be the emergency brake that I needed to stop the runaway MS train. With that, I left his office and after some more research, I found an MS specialist in Boston. I called her office and she said that she wanted to evaluate my case. I just needed a referral from my primary doctor to go and see her. So, I went to visit my primary care doctor and asked her for a referral. No? Why was everyone making this so hard on me? I didn’t understand what I had to do to get the treatment I wanted and was frustrated that everyone in the healthcare system was seemingly against me. I called up the Boston MS Specialist again and broke the news that I couldn’t get a referral. This was eight years ago this month in February of 2007. That month, I started that new treatment and applied the emergency brake to my runaway MS train. This eight year anniversary also marked my decision to be my own healthcare advocate. It took a lot of courage to say no to the doctors, but in the end I felt like I took control of my own health. Today, I have great open relationships with my healthcare providers and we make decisions together as a team. The previous blog is the author’s real life experience and his personal treatment decision. This is not an advertisement for any particular treatment. What works for one person may not necessarily work for another person. Please consult with your doctor to decide as a team what treatment option works best for you. There are many unpleasant symptoms that are well understood to be associated with multiple sclerosis, like fatigue, cognitive impairment, and spasticity. But there are also symptoms that occur in people with MS that aren’t commonly discussed, and may actually be overlooked by patients and physicians. One of our contributors, Matt, wrote an article about how his “startle reflex” is extremely sensitive, and it actually has a detrimental effect on his quality of life. This symptom, also known as myoclonus, impacts many people with MS, but it appears that many people don’t realize it was actually related to their MS. After reading Matt’s article, “Myoclonus – Why do I startle so easily?”, many of our community members shared their thoughts and experiences with us. Here’s what several of them had to say! I have this too!!!! Loud noises such as a loud TV or radio. People talking loudly or children screaming. My senses are all affected, including my hearing, eyesight, and smell. So THAT’s what that is! I have this problem too and I get really agitated by it. I’ve always been jumpy, but more so in the past 5 years. I have this too. It’s gotten to where I can’t even be where there are large groups of people, and even the sound of my own voice will rattle me. And I have gotten to where I don’t like to talk or socialize at all because of how much noise bothers me. I am also very sensitive to noise and I have strange sea like sound in my left ear. Thank you Matt for an excellent accounting of your journey with Myoclonus. I too, have had a major relapse and experience a higher sensitivity to certain things, one being sound. My neurologist and I have been working on subduing the worst and working our way down. Klonopin does not work for me. I take Nucynta at night and it helps, but the side effects are very unpleasant. It’s a very strong narcotic for pain. It takes away the “jerky” movement but it makes me incredibly anxious. I have not found anything else to remotely make the myoclonus better. I have high hopes for the future of medicine because I cannot fathom anyone living like this for the rest of their lives. I didn’t know there was a specific diagnosis for this symptom! I decided to share this as some of my friends might find it interesting. It is part of a long list of very odd symptoms I have acquired, and it was helpful to me when I found that this “weird sensory sensitivity” had a name, myoclonus. Psychologically, for some reason, the fact that there is a name for this condition is validating, and helps, somehow, to know that there are others dealing with this odd affliction that is not easily understood. I’ve always thought my exaggerated startle reflex was related to MS, but this is the first time I’ve seen it in print. I didn’t know what it was going on. It’s even worse in evening with the TV, my husband talking over the TV, the dog barking at the cat, etc. It’s sensory overload!! Now you’ve validated that it’s an MS symptom. Good post Matt, I have same symptoms, but flashes of bright light, sound and other stimuli, including stress, are involved. I had not tried to find out what it was called, but I knew it was brain and spinal lesions behind it – I am glad to hear it has a name. Oh my goodness, this was one of the new symptoms I developed about a year ago! My phone going off would startle me, the door slamming throws me into a panic attack, loud noises especially in the evenings seem so much louder and ear piercing. I have this really bad and the doctor, not my neurologist, always told me it was my Graves’ disease. I am so grateful to read this article. I developed this startle problem in the past 10 years since I was diagnosed with MS. I remember at times I was so startled it was actually painful. I don’t seem to do it as much as I once did, but good to know I wasn’t crazy. Thanks for your article. I can not thank you enough for writing about this because, like many I never connected this with being a symptom of MS and I never told my neurologist that this was a frequent experience of mine. I was never so resentful. I have to keep reminding people who know I have MS to calm down so I can calm down too. I knew startling was MS, but it’s nice to know that others are affected by people walking behind them. I had someone come around my desk to look at my computer and I got so nervous I had to ask him to move away from me. I felt like a great big “meanie”, but you have to do what you have to do. This particular symptom has affected me tremendously in the social aspect. For many years I could not have been more frightened to be around anybody doing anything because they feared that I would have uncontrollable muscle spasm. The reactions I got were not totally bizarre, however I noticed that it was not just me who was disturbed by my symptoms, yet most people tend to feel very uncomfortable around me because most people think that they are causing me to be scared. For anyone who is experiencing sensitivity to sound, there is another condition called “Hyperacusis” that involves sensitivity to sound without apparent evidence as to the cause. The primary difference between the two, from what I’ve learned, is that it does not (necessarily) involve the muscular activity, but more often results in pain, fatigue, and a multitude of other varied cognitive symptoms. There are a few subcategories of hyperacusis; we just recently discovered “Acoustic Shock Disorder” as the most likely diagnosis. What about you? Do you find that you startle easily? Did you know that this could be a symptom associated with Multiple Sclerosis? Share with us in the comments! In honor of National Love Your Pet Day, the “unofficial” national holiday set aside to give extra attention to and pamper your pet that you love every day. This is a good day to focus on the special relationship that you have with your pets. Having a pet has proven to provide many physical as well as mental benefits. Therapeutically, a pet can lower blood pressure and have a calming effect over an individual, which can lead to diminishing some pain symptoms. Pets also encourage communication (who doesn’t talk to their pet), as well as provide support and comfort. When feeling anxious or nervous about a new situation, perhaps lean to your pet for support. A pet is a perfect soundboard for thoughts and feelings and even better, they can’t talk back! Maybe there is an uncomfortable topic you wish to discuss with a loved one, try practicing speaking out loud to your pet exactly what you wish to say. The extra practice in expressing your thoughts can provide confidence and re-assurance in the situation. While your pets can’t role play the situation back with you, having practiced saying a thought or feeling may help alleviate some of the anxiety around the situation. It may also provide you with the opportunity to hear how your words would sound to another person. Have you ever made a comment and then realized ‘that wasn’t what I meant to say.’ Practicing beforehand allows you to make changes to ensure that your message is properly received. In what ways is your pet a support to you? What is love? Webster’s dictionary defines love as “a feeling of strong or constant affection for a person”. After a day like Valentine’s Day, it is hard not to question the concept of love. Perhaps you are in a long term relationship, maybe you have yet to find love, or have just ended a relationship. By definition, love doesn’t solely rely on a relation with another person, it can define the feeling you have for yourself as well. Truly loving yourself and having the respect for the person that you have become can be a challenge for some. Uncontrollable events occur in life that may change the way that one perceives themselves. Perhaps there are goals or outcomes that seem unmet, or feelings that are unresolved. Coming to a place of understanding and acceptance of the uncontrollable events and embracing the change they may have created is the first step in loving who you are as a person. By accepting the changes that have occurred, you allow yourself to move forward without any self-doubts or negative thoughts. But this too is a process. One does not wake up one morning and choose to accept the many years of life’s up and downs. Daily affirmations or positive thoughts about your self can be an effective way to practice self-love and acceptance. You can create your own, or utilize one of the many that can be found in books or online. The Law of Attraction states, “like attracts like”, meaning, what you put out into the world, is what you attract. If you feel positively about yourself and love yourself, you will attract that same level of positive energy in another. When you don’t like yourself, or don’t feel yourself worthy of love, it can be difficult for someone to find that in you as well. The change to a place of self-acceptance and love cannot occur overnight. If you feel as though you need additional support or help in removing the self-doubts or negative thoughts, a counselor may be able to assist in getting to the root of those feelings. Everyone has a right to be accepted and loved, personally and by others. If possible, seek help from a support group or counselor. It is never too late to make a change. During my initial hospital stay and subsequent diagnosis of MS, one of the biggest challenges that I faced was talking to my family. We had a history of multiple sclerosis in my family. My dad’s sister, Loretta, was diagnosed with MS in the 70’s and she passed away in 1981 due to complications of the disease. During that time, there was little in the way of treatment available to help her. Not only that, but the disease progressed very quickly. She passed when I was only four, but I still can remember her. She was in a wheelchair and she couldn’t talk, she could only mumble and moan. While I was laying in my hospital bed contemplating my diagnosis, I was thinking that I shared the same fate as my Aunt Loretta. The whispers around my bed from my family members supported my fears. As a result of these fears, the conversations changed. Family members started treating me differently. They were walking on eggshells around me, careful not to divulge any of their true fears of my future. Even with treatment, as my functionality returned, everyone held their breath for MS to strike again. Six months later I had another drastic exacerbation. Then, twelve months after that another one. It seemed like I was following Aunt Loretta down a perilous track. And my family treated me that way. It was to the point where I didn’t want to have conversations with them because I wanted them to remember the person I was and not the person I had become with MS. However, there were a couple of things I had going for me that my aunt didn’t have. One was timing. In 2005 there was a lot more knowledge about the disease and many more treatment options available than when she had it in the 70s. The second thing was history. I knew my Aunt Loretta’s story and I didn’t want mine to end the same way. Family members told me that she didn’t like the advice she received from a doctor, so she never went back to that doctor. I used that information to motivate myself to learn as much as I could no matter if the news was good or bad, scary or hopeful. I just wanted to get the most objective, up-to-date information available to fight. Lastly, I had hope. In the seventies there was little known about the disease. Today, there is research and scientific breakthroughs, social support networks, and hope. If I could go back in time with all I know today about living with multiple sclerosis, the fear and egg-shell conversations with my family would be dramatically different. I would use the resources around me, like My MS Journey, to educate myself and ease my family’s fears instead of staying silent. Today my family conversations are no longer about the horrors of MS. My family and I now talk about my future and my kids and all of the awesome stuff that normal people talk to their family about. Today we are a normal family and I just happen to carry the torch of multiple sclerosis. I have had it for approaching ten years now and I am still working, playing, being a dad and living the life I always wanted to live. That makes me proud to talk about my MS journey and how I have lived a great life despite my diagnosis. Sometimes you may feel like you are talking at someone. As if the things you are saying hit an invisible force field and bounce back toward you with no impact on the person you are speaking to. When this happens it can cause feelings of frustration. You may think: Are they even listening? Do they care? How do I make them hear what I am really saying (and not just what they want to hear)? Communication can be difficult when the person you need support from is on a different page. You may feel they are unresponsive, unrealistic, or uncaring. The other person may be thinking about something totally different, they may be unmoved by your appeals, think you are incorrect in your logic, or something else entirely. You can only do your best to communicate your needs and sometimes you may not get those needs met. Why, because communication is a two-way street. Talking at someone rarely effects change. To make a difference it often requires both sides to give a little and meet somewhere in the middle or for one person to make concessions to another. Or “If that doesn’t work then let’s talk about what other options for treatment we have available and try to select something we can both agree on.” Creating a clear plan of action can remove frustration and set realistic expectations for each party. If ultimately, the other person refuses to listen or budge on an issue you may have to try and get your needs met in other ways. “My mom agreed to come over to help wash the clothes” or “I’m finding a new doctor.” As you can see in some circumstances seeking other support can help to resolve the issue but sometimes at a steep cost. If you run into a situation where someone will not meet you in the middle you will need to review the pros and cons of your alternative options and remember that communication is a two-way street. Thank you to all of the artists who were part of last year’s Art Showcase for artists with multiple sclerosis. 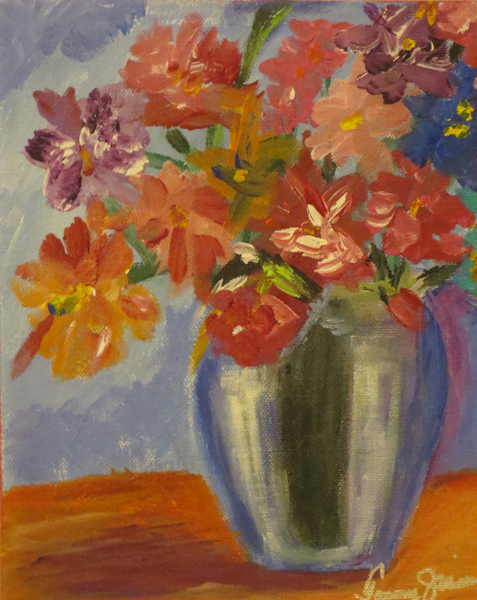 The wonderful artwork and personal stories have been inspirational to many who have visited our online gallery and who have sent and received online art cards, celebrating the lives and talents of people living with MS.
MSAA will soon debut the 2015 Art Showcase in March as part of MS Awareness Month. So, get ready for some new artwork and stories to enjoy! As before, each month we will share with you an Artist of the Month with a new online card that you can send to friends and family to spread awareness of MS, while showcasing the wonderful talents displayed by artists with MS.
You still have time for one more look at last year’s collection! Then, get ready to enjoy the many new works to be featured in MSAA’s 2015 Art Showcase! “My name is Tammy Jennings and I live in picturesque Monterey, California. I am a 54-year-old, single woman, and I have been living with multiple sclerosis since 1996; I was 37 when diagnosed. I worked full-time until December 2006 when I had to “retire” as the unpleasant “side-effects” of my MS became too much to handle in a work environment. Be inspired – please send an online card featuring artwork by MS artist Tammy Jennings and spread awareness of MS and MSAA.